I recently wrote an updated article on “How to Stream the NHL Without Cable for 2018–2019 Season”. Click here to check it out. I’ve been excited for the new NHL.tv launch ever since the NHL announced this summer that MLB Advanced Media (MLBAM) would power their website, apps, and video streaming. To be perfectly honest, I never had an a real issue with GameCenter Live (GCL). Video quality was good and IMHO had some of the best adapative streaming out there. 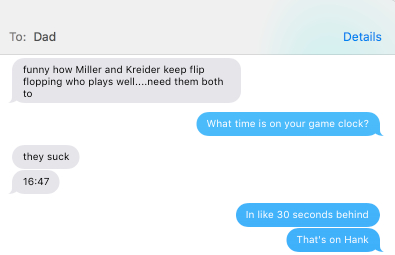 My biggest gripe was that it was always 1–2 minutes behind the live broadcast, so it was extremely spoiler prone (either texts from friends or following on Twitter). Yes, I’ve been known to hide my phone the last 5 minutes of games. Coming from a tech, media, & sports background, I know how hard it is to completely rebuild a site and platform like this in 6 months. While making this type of transition midseason is difficult, it certainly feels like they bit off more than they could chew. Spoiler Alert! Yes, the stream was still 30–90 seconds behind at any given time. This meant I was still getting spoilers from my Dad and bloggers on Twitter. Spoiler Alert! Game Clock still behind. Yikes! The NHL touted this more than anything in all their press releases. It’s hard to judge since I never actually got it to stream at its highest rate, but the messaging behind this was partly marketing mumbo jumbo. They will feature a higher quality picture to match the HD viewing experience on a regular television by speeding to 60 frames per second streaming on all platforms. It was previously 30 frames per second on all platforms except connected devices (which were already at 60 frames per second). To go a step further, based on the release notes from the App Store unless you have an iPad, iPhone 6 Plus or iPhone 6S Plus — you will likely see no changes to stream quality. Adaptive streaming changes the video quality and stream speed in order to match your internet connection. This means that it will decrease your video quality so it doesn’t have to buffer or freeze. This was actually GameCenter Live’s best feature. Part of the reason I paid for GCL was because my Slingbox couldn’t do this nearly as well. While quality would decrease as my internet connection did, it would almost never freeze (and still be viewable). 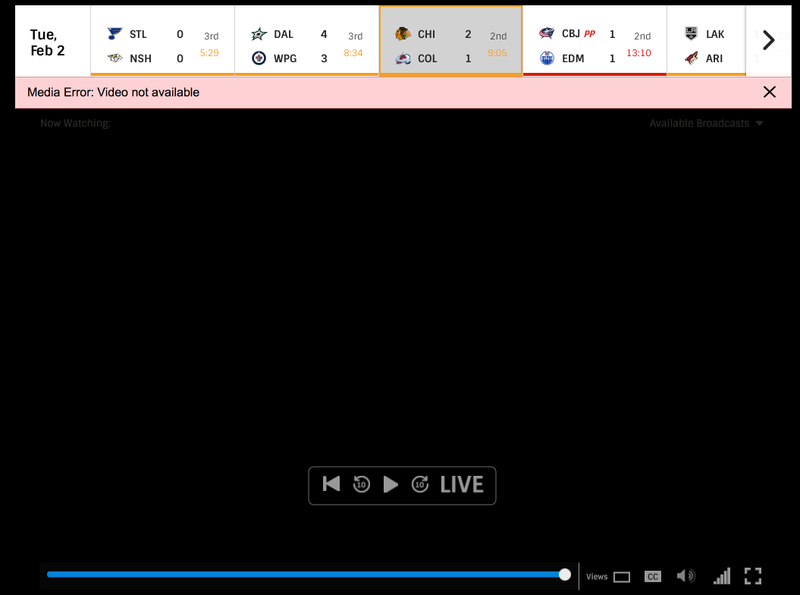 Last night’s broadcast was the worst I’ve ever seen since they launched the NHL streaming product a few years ago. My broadcast froze ever 2–3 minutes and it almost always display unwatchable video quality. While adaptive streaming works well, sometimes it can be over agressive. GCL had a nice feature that let you switch between stream qualities (256kpbs, 500kpbs, 1mb) to override the adaptive streaming. Also, for those of us not on unlimited data plans, this allowed you to reduce the video quality on cell to not burn through your data plan. Being a west coast transplant following an east coast team, there is something nice about watching the intermission show. It just brings you closer to the team and the city. Previously, you used to be able to catch 5–10 minutes of the pre-game show and the complete intermission (on the home team’s broadcast). No more! A few times during the game, NHL.tv cut away to their “The Game Will Return Soon” screen either during the action or returned after the puck has dropped. When watching a game, it’s great to be able to rewatch a goal, a great pass, save, or if there was REALLY a penalty. In the old GCL, you could go back/forward 15 seconds and jump to live. These are still available if you’re viewing on Web, but no longer can you do this in app. One of the cool features of the old GCL was the ability to watch multiple games at once. You can still jump between games, but the app no longer lets you view two (or even four) games at once. They do still support watching multiple camera angles in a single view, but to me it has always been a pointless feature because the goalie cameras are always 5–10 seconds behind the main camera. Flash is dead. Even Adobe isn’t supporting it anymore. MLB.tv moved to a new HTML5 viewer last year, but for some reason didn’t use it for NHL.tv. Flash is a huge memory hog and dramtically slows down your machine while it’s running. This makes it hard to use your laptop for multi-tasking while watching a game (maybe corporate america paid them to add this feature). What the stream on Web looked like! I could write a seperate article on the new NHL App, but for starters — it is really slow. Spin your partner round and round! In their press release, they touted their new awesome responsive website. Before even downloading the app, I knew this meant that they were going to transition to non-native screens in their app. While this means they only have to build screens once for Phone, Tablet, App, & Web — it also means that it is slow to load and reloads nearly never time you go to the page. For instance, you go the standings page and come back 3 hours later, it has to reload everything (team logos, etc.) even if no data has changed. Standings rarely change, why do they take forever to load! If you go to the scoreboard, the only things that will have changed are the score, the time, and the badges (PP, etc.). However, it reloads the entire screen including which channels the game is broadcasted on. If you go to box scores, it takes 5–10 seconds to load and part of the screen sometimes never appears. If you want to view a player’s stats it takes nearly 10 seconds to load! (and they don’t have season by season breakdowns). Despite my gripes with the launch, I have a lot of confidence in MLBAM. They have a great reputation and I think long-term this was a great move for the NHL. However, I think this launch feels extremely unnecessary and rushed, rather than rethinking how to improve the fan experience. Next week, I’m going to discuss how all of this could have been avoided by focusing the product and managing expectations.